← How can our Family Respond to Social Issues? This last week was a bit unusual for us as it was a short schooling week due to Easter and Anzac Day at each end of the week. I was also sick with a bad head cold/flu symptoms so we actually didn’t do much formal schooling. There was still a lot of learning that occured though. 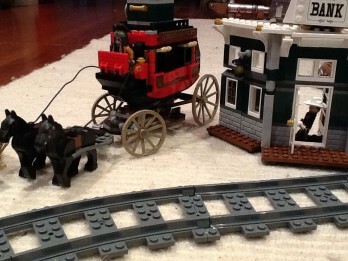 The kids spent three days building Lego they had received for Christmas which they hadn’t yet got around to building. I downloaded an ebook on ‘Bible Battles’ and read that to them whilst they were building. They absolutely loved it and both of them kept encouraging me to read more whenever I stopped. This is an excellent way to read the Bible to them as it tells the Bible stories but in a very exciting manner that makes you want to know what happened next. You can download it at http://www.wholesomechildhood.com/LetticeBell/ for $7.77 USD on sale at the moment. Included in the package are other great Bible stories as well as the ‘Bible Boys’. There is also a sample you can download as well as the stories being on audio for those car trips etc. I found it worthwhile as it made the Bible come alive for them. ANZAC Day: my intention is one year to go to the Dawn Service in Melbourne with the kids on ANZAC Day but this year we didn’t get there. I wasn’t feeling well and hubby was busy with work so it just didn’t happen. Instead, Matey watched the service on television. He has a fascination with war at the moment and a lot of the stories we are reading have that subject in them. 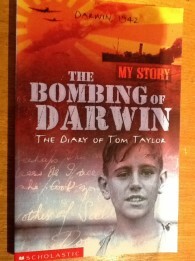 A great story we have just read is part of the ‘My Story’ series and is called “The Bombing of Darwin” by Alan Tucker. 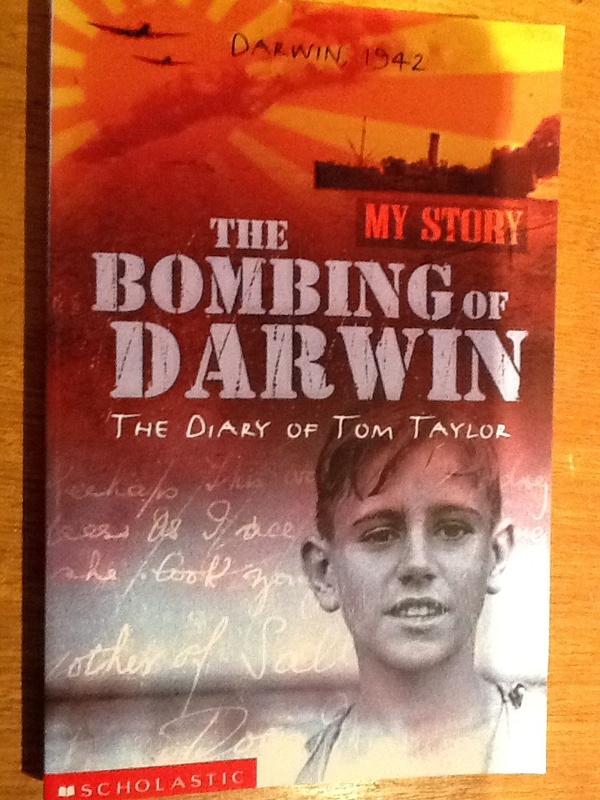 It is a good story of a boy’s experience of moving to Darwin with his mum. His dad was already working on the wharves there. His mum was killed in an air raid and his dad could not be found, later we realise he was injured. This boy was then transferred to South Australia to be with relatives. He was later reunited with his injured dad. Quite an emotional war story but a great description of what can happen during war, even if the country isn’t directly in a war zone. Cambodia trip: Our family is going to Cambodia for a fortnight in June/July with a team of people from our church. We will be visiting several children’s centres and running programs there plus we will hopefully see where the container of books that our family collected, is going to be. Our preparations have commenced and our team meetings have begun. The kids are starting to get excited. The leader of our team has been very generous and has fully welcomed our kids as part of the team and enabled them to lead a part of the training yesterday. Princess responded to this really well and it has helped her in being more positive about travelling to a third world country. Matey just loves the whole process and has so many questions. 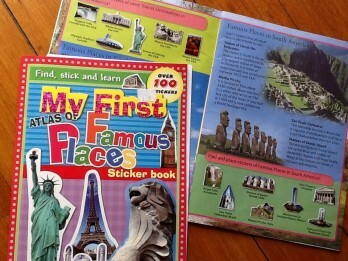 Geography: we met up with a homeschooling friend during the week for the kids to learn some geography together. 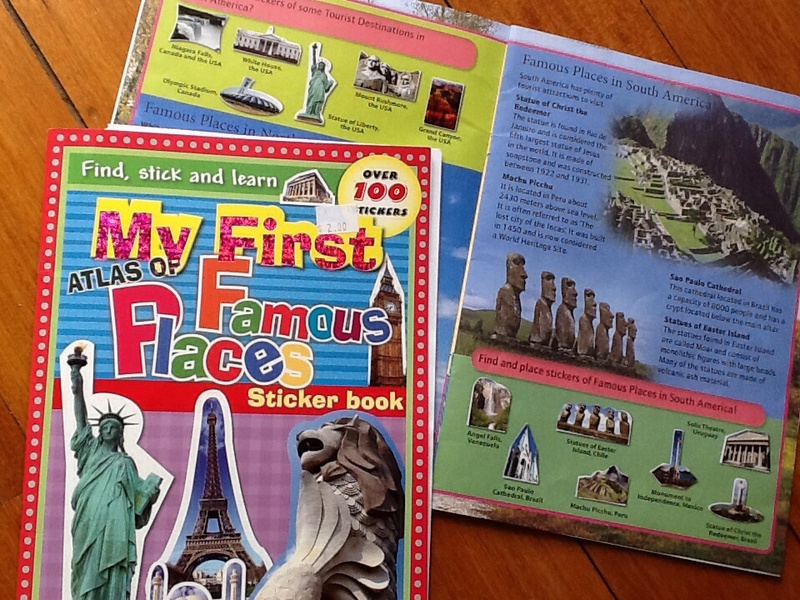 This friend had bought some $2 sticker books from a newsagency and it was a fabulous opportunity to learn more about other countries. It is one thing to know what monument or castle or bridge is in a country, quite another thing to recognise what that object looks like. My friend’s younger child was able to do a lot of the stickers by looking at the shapes so it was suitable for a cross section of ages. I was quite stumped at times by some of the pictures and trying to work out what they were. It also had word searches, mazes, crossword, jumbled words and a brief explanation about some of the famous places. Great value for $2. I encourage you to keep a look out for interesting things like this. It has so much learning value in it. The kids didn’t finish in an hour so we are meeting again to finish it and also for them to play some games learning to recognise the different places. Healing Rooms: Saturday was the monthly Healing Rooms that we are a part of as a family. Matey was a bit reluctant to go this time so we changed things around a bit and both kids had an opportunity to be on the welcoming desk. They loved this role. It is straightforward, welcoming people and getting them to fill out some forms and explaining the process. Princess then joined my team for praying for people and saw two people healed of back pain and headaches and toothache. She also made a beautiful booklet to encourage a girl who was struggling with school. I encourage you as parents to start stewarding your children’s gifting, getting them involved in ministry alongside you (where appropriate). We can’t expect them to become adults and just ‘know’ what to do without any training. So much more is ‘caught not taught’. Parent guilt: As a parent, and especially with homeschooling, I find that it is easy at times to look at how much we don’t achieve. This is very evident with homeschooling. I find the hardest thing is not comparing what my children are doing, or not doing, to what other children are doing. Also, I tend to feel guilty when I have a relaxing week with my children when other children are back at school. Does that mean my children are missing out on something, I can be tempted to ask myself. Realising that we are all different, that this is the way I am called to homeschool at the moment, realising that all children learn differently, and instead just relax about the whole process helps a little. I find it more useful to try and not go there in my mind in the first place. I instead focus on the fact that this is what we have decided for now, this is what I am capable of for now, and God knew all that in giving my children to me to parent. Instead, I need to use that emotional energy to focus on the next step. How about you? How do you deal with the guilt of ‘am I doing enough as a parent’? 1-My kid’s school only went back today, they had 3 weeks off. So your kids didn’t do less than those at our school. 2-When a class teacher is sick that class either works at a slower pace, or have fill-in teachers. Either way, they aren’t doing their normal program anyway. 3-Seriously though, how can your kids be just getting to their Christmas lego now!!! There is no way anyone in our house can keep a lego box unopened for more than 5 minutes! You aught to be ashamed of yourself for THAT, not the homeschooling bit. 4-Homeschool learning happens at s much more condensed rate than at school. Homeschool learning doesn’t have long introductions to every lesson or long packing up times at the end. They’re not left waiting while some kid is mucking around up the back, etc etc. You will easily make up the time. So, take a week off, you’ll teach tour kids a valuable lesson about how to look after yourself when you’re sick, rather than ignoring your body and pushing on in order to keep achieving something. Too often our society Role models a driven nature. My motto is -Don’t “soldier-on,” rest up. That should be what they learn. Thanks Jackie. Comments duly noted. Matey in particular usually doesn’t let Lego go without making it up but it is a sign that we have been far too busy since Christmas and we need to stop and relax for awhile. Thanks.